"I thought you said it was spitting distance ………"
It's amazing how many rude gestures you can make whilst wearing a glove puppet. Can I hear pan pipes ? 'Where we going'? 'Alpaca my bags'. "Com on up there, you're move like a......snail?" "Look, The Lion King's here." "Oi, mate! Haven't you seen a llama before...? Wind yer neck in." "That's a dangerous thing to do." "Yer, no fear, he's always sticking his neck out." His name is John, are all Llamas called John? I bet he's a right pane in the neck! Bernie Clifton tries out his new act on Broadway. Breaking News - Pantomime horse escapes from theatre. Police stay taxi driver played a leading role." That face rings a bell. Don't wanna be sat behind him in the theatre. "I'm here about the big apple?" You won't believe it! Rod Hull waved at me today!
" …. 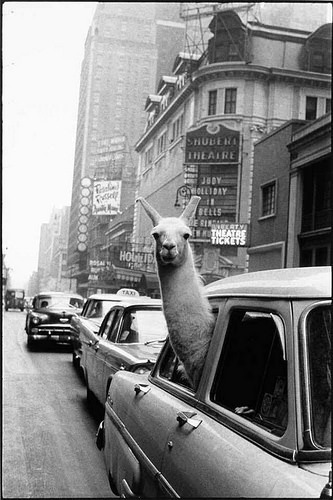 yes dear, the brochure did say that, in the standard model, the seats were covered in Llama wool .."
Next, right and the Llamarama drama school is on the left. Is that Spit the dog? Alpaca rucksack, if you carry on driving.